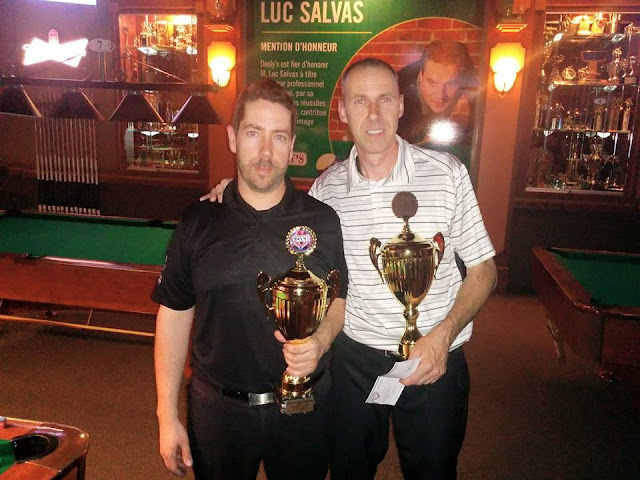 This past Saturday May 30th, Dooly's Valleyfield played host the the Québec Federations Pro Division Grand Final. There were 54 players who qualified for this event by playing in at least two Professional tournaments this season. However only 27 of those elibigle showed up to partake in this $3500 guaranteed prize pool. Like most other circuits, a portion of each entry was withheld and added to the final tournament. Despite the small field, all the usual favourites were in attendance for this tournament such as Alain Martel, Danny Hewitt, Luc Salvas and Sylvain Grenier. The only one top player missing who has been playing was Francis Crevier, who was in Vegas playing the V.N.E.A team Championships. In what can be considered a bit of an upset, local fan favourite Luc Salvas was eliminated early. It was two strong semi-pro's who ended Salvas' bid at being the Grand Final winner. It was Daniel "Cold Blood" Gagné who beat him on the winners side 9-8. Then on the losers side of the bracket another strong player from Valleyfield Eric Claude beat Salvas 7-6. By the time I was able to reach the venue it was already down to the final four of the tournament. Alain Martel made quick work of Martin Daigle 7-1 and waited briefly for the winners side final to conclude. In this match Sylvain Grenier got the best of Danny Hewitt earning himself a spot in the final. Here is a video of the final out by Hewitt for the win.